Snapping these maternity photos for Jordan and Shauna felt like finishing the first book in an epic series. Our photo journey with them began in May of 2012 when we shot their engagement session on a ridiculously hot day. Truly committed to the aesthetic cause of their shoot, Jordan and Shauna rode 45 minutes from Tecumseh to Leamington in a non-air conditioned truck in order to transport a rowboat as a prop. It still baffles us that they somehow managed to look incredibly attractive despite the sweaty drive. The addition of the rowboat to the marshland scenery took the photos from beautiful to magical. And then, the magic continued when we photographed their wedding in October of 2012. A few months back, Josh and I were scrolling our Facebook newsfeed when we came across an adorable photo of Jordan and Shauna’s Airedale, Quentin. He was sitting next to a sign that read “Big Brother, October 2014”. Within an instant we were giggling and had a mini dance party celebration in the office. For this maternity session, we opted for their home as an artistic backdrop, a very fitting choice because of the time they have spent meticulously decorating it and making it their own. The yummy treat add-ons are from Shauna’s sister, Shelby, of Shelby’s Sweet Shoppe. Following their homey photo session, we headed over to Brunet Park where we had captured their wedding photos—perhaps, we hope, a little tradition in the making as their family grows. 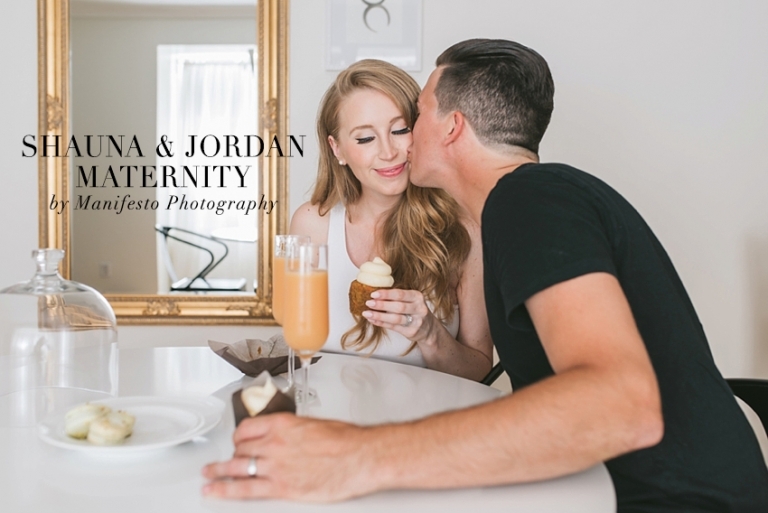 Jordan and Shauna, seeing you blossom as a family has been an absolute honour, and we so appreciate you for trusting us with all of these special moments. We can’t wait to start the next book in our photo adventures together. I may be biased, but, these are seriously amazing!